2.We go over scope of work specified in the insurance adjusters summary report, walk the damaged roof adding any supplements that may need to be added if the insurance adjuster missed something. 3.We send our signed contract to the insurance company along with our adjusted approved estime and apply for the building permit. 4.If there is a mortgage on the home, the mortgage company’s name will most likely be on the check along with yours. Most likely there will be several forms to be filled out and notarized. We provide our Fed Ex account for you to overnight the check for endorsement and forward the documents needed to process. 5.We complete the scope of the work, have you fill out a customer satisfaction. We’ll work very closely with your insurance adjuster. We excel in dealing with insurance adjusters and in making sure there are no surprises. We thoroughly document the job so we can send your insurance adjuster photos and any other documentation they deem necessary. Our primary concern is you, the customer, but we also work to keep your insurance company happy, too. This is just a partial list. 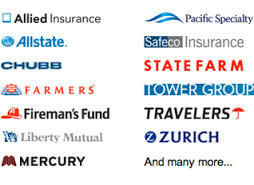 We accept all insurance, not only those listed. If you don’t see your insurance company here just give us a call at 1-844-363-7436. We can quickly check and see if your insurance policy will cover services that we provide. Since we opened our doors in 1993 we have never had an insurance agency not pay us because we weren’t on their list And we never seen a contract where the insurance company made the client use the insurance company’s vendors, either.